I noticed a beautiful banner on the wall of Arwen’s room in the scene where she and her father are having the ‘I’m going to stay’ – ‘No, you’re going to go’ talk. It is a beautiful blue (silk?) 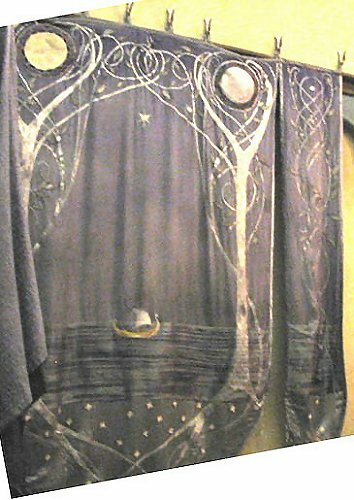 with silver trees embracing a moon embroidered/appliqued onto it. You can use the image to the right as a reference (click for full-size), or if you want to do something similiar, you can use the trees from the gate of Moria as a reference (as the design looked extremely similiar to the one on her banner). 1) On paper draw out the trees to the size you want on your banner, cut out the template, then pin the pattern(s) to the fabric for your trees. 2) Cut around the template and set your fabric pieces aside. 3) Do the same thing with the fusible interface – this will go behind the trees. 4) Place the fusible interfacing pieces onto your banner where you want your trees to be, and then pin the tree fabric pieces down on top. 5) Follow the instructions from the interfacing package instructions to adhere the two fabrics together. 6) When it has cooled you can use your embroidery floss to put accents (and perhaps beads?) onto the banner. Fancy quilting stitches look good. I have a book on how to make crazy quilts which gives some very nice ideas for stitches and beads. 7) Make sure the edges of your banner will not fray (ie. hem it) and then hang on your wall by whatever method you choose. This could also be used to make banners for dwarves or orcs or humans as well (King Theoden’s hall has lots of banners). That is a cool banner. Thanks much for sharing the knowledge of making this and other banners! Really very lovely. I might make a smaller version and put it by my bed.